Founded by the Jesuit Missionaries in the 16th century, the missions of San Ignacio, Cabazan, and San Javier still stand today, much as they were back in the 1500s. This introspective tour will fascinate you, as you step into centuries past, and explore these pillars of the Spanish Colonial culture of Sinaloa. Nestled in the foothills of the Sierra Madre mountains, these missions will charm you with their architecture and colonial flair, and you'll be fascinated by the history and legends shared with you by your expert guide. Meet the local people, and enjoy a home cooked lunch at a local restaurant - so good! Stroll the cobblestone streets of San Ignacio, Cabazan and San Javier, admiring the well preserved colonial style of the surrounding communities! 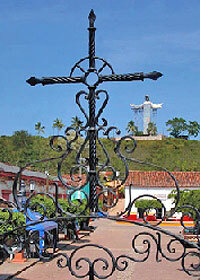 Look upon the giant statue of Jesus Christ, looking down on San Ignacio cathedral! Be intrigued as your expert historical guide shares ghost stories and legends of these mystical locations, along with a deep historical aspect! Visit La Casa de Dona Trini - where a local resident will serve you a home cooked lunch (optional)! Don't Forget: Camera, Extra Money for Shopping or Lunch.